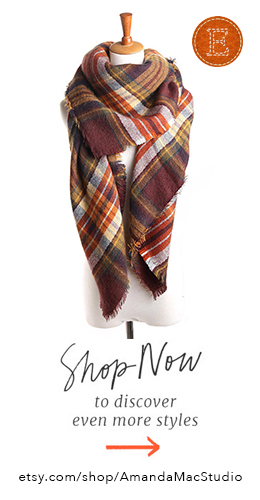 Now that I’ve been running my Favorite Things Sweepstakes for a few weeks now (two plaid blanket scarves left to win by the way!) I figured it was about time to post some of my own holiday favorites. 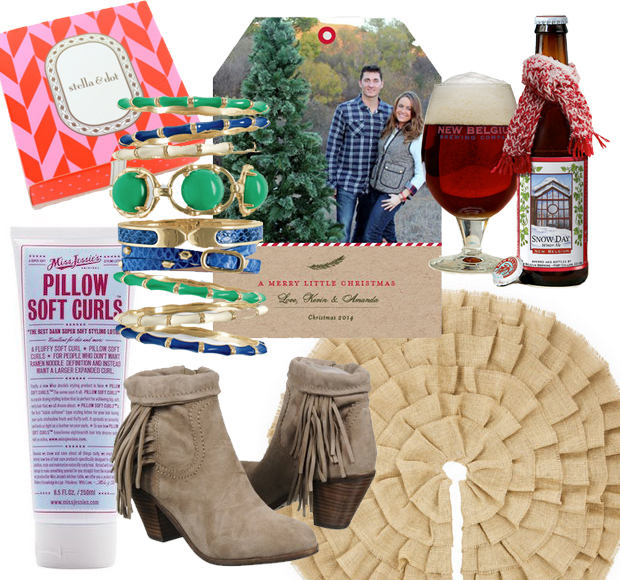 Check out the list below for items I love and the merchants who create them! Have favorites of your own? I love learning about new goods and vendors and would love to hear your shout outs! This is my second Christmas with Kevin and things are getting serious—joint Christmas tree serious. We’ve already started collecting ornaments (OK, we have one ornament we picked up in Tahoe last ski season) but the goal remains the same—to continually add to the adorableness of our Christmas tree each year. Now that we have the tree and the Tahoe ornament, we were in need of a tree skirt. Kevin would have been fine with a Trader Joe’s Paper bag stuffed under the greenery, but I wanted something one-of-a-kind that would melt my heart every time our tree lit up. Found It! Etsy’s SPCrafty has the most darling tree skirts I have ever seen, or could ever want or imagine, and the quality, OH the quality! It’s just amazing. If you’re looking for something special as well, not just for the tree but for under it, check out Etsy and SPCrafty—her products will make your tree shine just a little brighter this Christmas! There is nothing I like better than a great beer, and living in San Diego, the craft beer city of America (I bet you didn’t know that did you?!) I have the best brews right at my taste buds. But when we’re not out sipping our way across the south bay and just want to bring a pack home, we like a little variety in our hops. A great variety pack we recommend, New Belgium Folly Seasonal brews. Are there fancier, more exciting beverages out there, yes, but if you’re looking for something inexpensive to sip while you’re unwinding by the fire, you can’t go wrong with New Belgium. When Kevin asked me the other night why I was spending so much on greeting cards this year, I just stared at him blankly. Me? Use anyone but Minted? Silly boy, Target photos are for kids! I am smitten with Minted and I’ll scream it from a mountain top! Everything from their chic designs, easy-to-use website, the fact that I’m supporting growing independent designers. LOVE. It’s just a great company! Boots. Boots. Boots. Every chance I get to wear anything but heels I jump all over it. I’ve already showed you my cognac riding pair by Sam Edelman from this fall, but my new Louies are just as cute to boot. Sorry, couldn’t resist! Great quality and comfort. Highly recommend! I have naturally wavy hair which has both its ups and downs. It’s wonderful when I want to rock the beach bum look and not do a thing to my hair, and horrible when they only look I’m going for is the sleek, professional one. Since the majority of my week is spent in the office, alas, no beach bum girl. The almost daily blow dryer takes a toll on my locks, especially in the chill of the cold winter air. I’ve tried many products over the past few years, trying to find a way to control my waves and be able to sport them in the office. Enter Soft Pillow Curls. A dab of this after each shower softens my hair and controls the unwanted frizz, making my hair conference room suitable. It’s not sticky, greasy or expensive. It gives you exactly what it’s named. Aside from my little gold stand necklace that I wear almost daily, I’m not a fancy, expensive jewelry kind-a-girl. If you want to buy me high-end designer jewelry, that’s wonderful, but you better darn well make sure it’s insured! Fashion jewelry on the other-hand, LOVE the stuff. It makes for a fun outfit and if something does happen to it, well, it’s not the end of the world and your significant other won’t beat you to death over it. Stella and Dot is my new favorite trendy jeweler. They have the most fun designs that won’t break your budget. Be sure to peruse their statement necklaces for a punch of color this holiday season. The older I get, the more simplistic my closet, my fridge, my home and overall life seem to become (I say this as I knock on a redwood tree trunk!) If I don’t wear something, I toss it to Goodwill. I’ve done away with preservatives and pre-mades—mostly. And life drama? What life drama? I spent way too much time in my twenties caring about silly things (and people) that didn’t matter and not enough time on the things and people that did. This Fall, I’m keeping my wish list simple—just the way I like my life! The J.Crew Herringbone Vest is a staple. Period. If you Pinterest at all, you know what I’m talking about. It’s everywhere and everywhere for a reason—it’s adorable. It truly is the must-have for this fall. As savvy a shopper as I am, I can’t find anything that compares to this sleek little number. It’s thee one and only. I’m not exactly keen on spending $108 for a puffer vest, but I (and what I recommend) is keeping your eyes peeled for a J.Crew Factory discount. It’s bound to happen and therefore this cute little number is bound to be in my closet before the temperature dips. The Infamous Zara Tartan Scarf. This too is a fan favorite, but is from last year’s line. This is truly unfortunate because I believe this style is more coveted this year than last. So if you’re having trouble finding an old Zara original, buy this amazing find on Etsy. It’s the same pattern and material we’re all craving and it’s a third of the price. Anthropologie Measuring Spoons. How cute are these?! I don’t need them, but they are just too cute not to add to my cupboards. Food is beautiful and cooking should be too! Wide Brim Felt Hat. I’m a hat girl, always will be. This is the seasons “It” hat, and ‘It” will be mine. Fall Wreath. I’m not sure which wreath I want, but I do know I want one. My empty entryway doors just feel naked without it. Do I buy one? Do I make one? Which one? Do you have one you recommend? The possibilities are beautiful and endless! Sorel Boots. Even though I live in San Diego, that doesn’t mean I live in flip flops and a bikini—mostly. Kevin and I thoroughly enjoy trekking up north, hiking all that California has to offer and camping when we have the time. Sorels are like the grown-up version of Uggs. 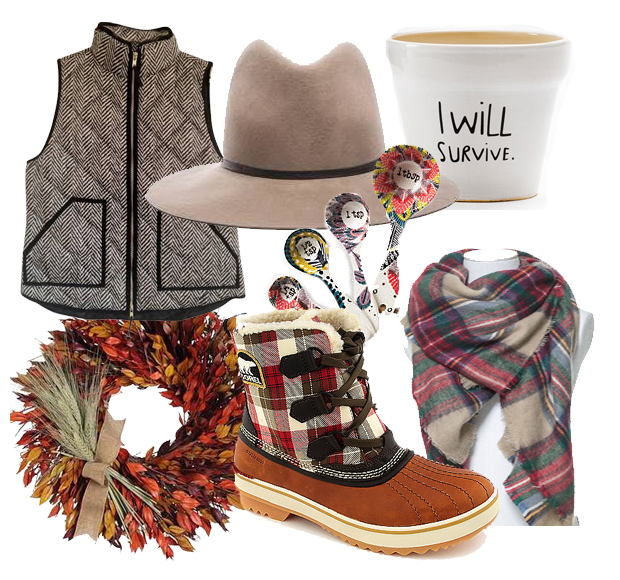 Adorable, warm and you can get away with wearing them about anywhere with anything. And no, I will not be wearing my new Sorels with a jean mini skirt—that was SO Alpha Delta Pi circa 2005. I Will Survive planter. Anything that helps save my herbs is a step in the right direction. I’ve killed more basil plants than the cast of the Walking Dead has killed Zombies. My plants need positive affirmations. I WILL GROW. I WILL SURVIVE. I MUST HAVE THIS PLANTER. I know there are only a few items here, but like I said, simple sweetheart. I’m easy to please these days! 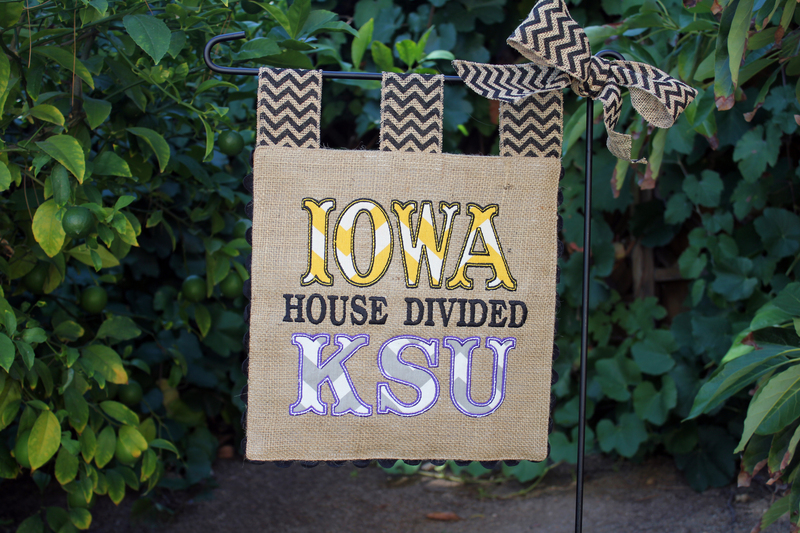 Even though Kevin and I have become more-so house united VS. house divided (I made him promise to keep cheering for my Hawkeyes if something were to ever happen to me) I have still always loved the idea of a house divided something or other. What a cute way to showcase your home’s favorite teams without fighting with your partner for lawn space—not that I would have to fight very hard, our lawn would look horrible in Power Cat Purple. I’ve been keeping my eyes out for the perfect house divided yard sign for some time now but never found “the one” until now. This little number was a random Etsy find (I love love LOVE Etsy)and may I say it certainly was a find. I couldn’t be happier with my little burlap banner from Sewgoddesscreations. She did quality work and it looks wonderful in our front yard (even with the bit of purple I’m allowing.) So if you’re looking for a house divided something, you won’t be disappointed with this little number—I highly recommend it… especially if it’s stitched in black and gold. Go Hawks! Love it? Want your own house divided sign? Check out Sewgoddesscreations She’s wonderful! Congrats Mr. & Mrs. Dziuk! One of the best feelings in the world is knowing that a dear friend has found the one, and not just the one she loves, but one that you love because you understand how much the two of them are truly meant to be together. That’s exactly what Melissa has with Mitch—and I couldn’t be happier for the two of them! Their wedding was gorgeous, with a Granby, Colorado backdrop, and Melissa made everything so perfect, beautiful and low maintenance—I’ve been to, been in and shot my fair share of weddings, and that right there is a biggie! So congrats to Mr. and Mrs. Dziuk on their recent nuptials and a huge thank you for making me a part of their special day. Love you both! Some of the best memories I have are those spent with my mom in the late 80’s, dancing around the living room of our old farm house on that hideous shag carpet. She’d flip her permed hair with bangs and I’d rock my stirrup pants. I remember when dad first brought home a five compact disk player–that’s right, FIVE! It was the size of a deep freeze and cost them a month’s mortgage. Even though I’m far past stretch pants and my music now plays from a magical device that fits in my pocket, I still hold tight to the music of my childhood–The music who made me who I am today. For Mother’s Day this year, I wanted to do something over the top for my mom–something she’d (we’d) be able to hold on to forever. I surprised her with a plane ticket home and two floor seats to an artist whose music was a sort of metaphorical glue for us all of these years. 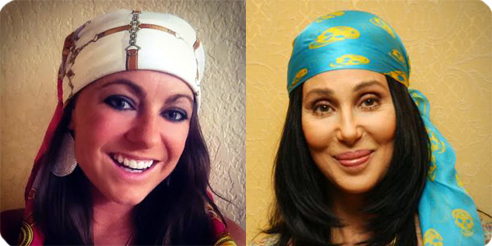 Cher has been more than just a singer to me, more than just fancy costumes, glitter and big hair–She was one of the many ways my mom was able to subliminally instill heart and fight into her daughter. Cher’s music has acted as a drive for me, an inspiring push to succeed. She reminds us that, no matter how tough the situation, you won’t break. I’m not a person to crumble, but sometimes it’s nice to have a reminder that you won’t. Cher has helped my mom be that reminder since I was a little girl. Were there Indian headdresses, acrobatics, a three-story-tall Trojan horse and 56 costume changes, Yes, and damn did she look fabulous. But for me, this concert was so much more than wigs and glitter. I was able to sing along to the songs that helped shape me into the Independent person I wanted to be, alongside the person who made me the independent being that I am. This was a night I’ll never forget, and I have two amazing women in my life to thank for that.